In this section you will find a short description of the steps you should take into account when printing with the dddrop 3D printers. 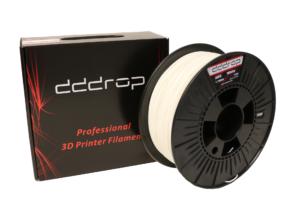 Also, the basis print settings of the different dddrop filaments are explained. This manual will be updated continuously. Before each print, clean the glass bed with a tissue and the dddrop bed cleaner. This results in a better fixation of your 3D model to the print bed. Even if you didn’t touch the glass between the prints, you should do this step. During printing, the filament will leave some deposit, that can result in fixation problems during the next print. Cleaning your glass bed before each print is really important! In most situations, ABS can be printed directly on the dddrop 3D printers. However, in case your 3D model warps, please call our support department (+31 (0)314 – 377050). Tip: When you print a 3D model with a small footprint it can be helpful to use the “BRIM” option in Slic3r/Simplify3D. In this way you increase the contact area and therefore the fixation to the glass bed. After printing, the “BRIM” option can be removed easily from the 3D model. This is often only one layer. Check your filament before each print. The outer winding’s of your filament can be entangled or loose. This often results in filament blocking and it will destroy your product (parts will be unfinished). Solution: Temporary remove the filament out of the nozzle. Unwind the loose outer winding’s of the filament roll and rewind them nice and tight again. If you experience problems with the attachment of your prints to the glass bed, check if your print bed is still properly leveled. It only takes a few minutes but it’s an important step to have good 3D prints. Please consult the user manual of the dddrop Leader AND TWIN. Note: The dddrop 3D printers are very stable and robust printers. Performing this step is often not necessary. Please keep in mind to use not too much force on the print bed when removing the 3D model or cleaning the glass bed. 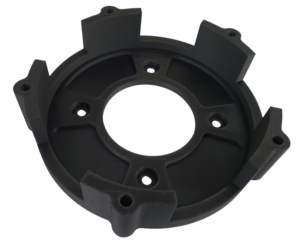 When you increase your printing speed, you should increase your temperature for a faster extrusion. In case you increase your printing speed up to 125%, you should increase your extruder temperature with 5°C. Please leave your fan on. Deactivation of your fan will cause overheating of your print head by five or more layers. The higher the nozzle- and bed temperature of the first layer, the better your 3D model sticks to the print bed. After one or two layers, please lower the temperature. This will prevent the so-called ‘elephant feet’ (deforming of the lower layers). Be careful: Filaments from different suppliers can have different nozzle- and bed temperatures. Never use silicone-, Teflon or other sprays for lubricating your filaments. The filament will not run smoothly through your print head, resulting in destruction of your product. Also these sprays damage the print head. Furthermore, it provides a greasy layer to the filament, which causes poor adhesion to the print bed. 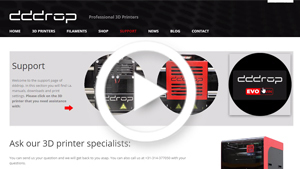 You can download complete settings for Slic3r and Simplify3D in our dddrop support section. Here you will find good information about print quality problem and possible causes (Simplify3D). .. .BASIC Print settings for the dddrop filament series. These are basic settings to get you started and find the best settings for your products. If you have a Bronze/Silver/Gold Supportplan you can contact Tech-Support for tips. * Always update your slicing software to the latest version. Then import the .fff file(s) to Simplify3D. 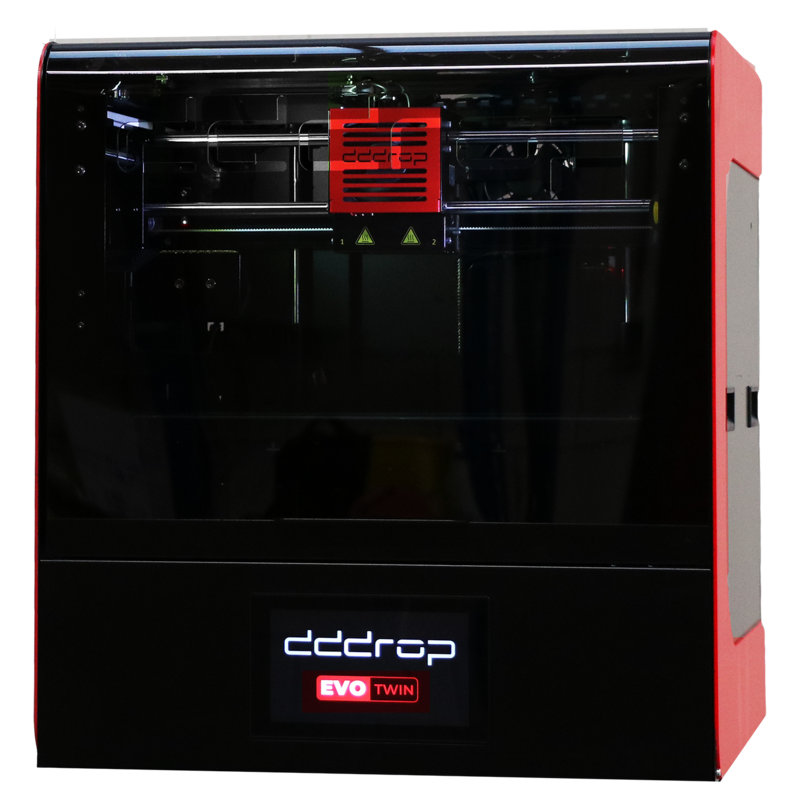 The dddrop EVO TWIN will update automatically when connected to the internet. If you have no internet connection available, please contact support for upgrade-instructions.